Just install the extension via the Extension Manager or via Composer and you’re done. There’s nothing more to do, except tuning the configuration to your taste. The configuration is divided in three sections, detailed below. 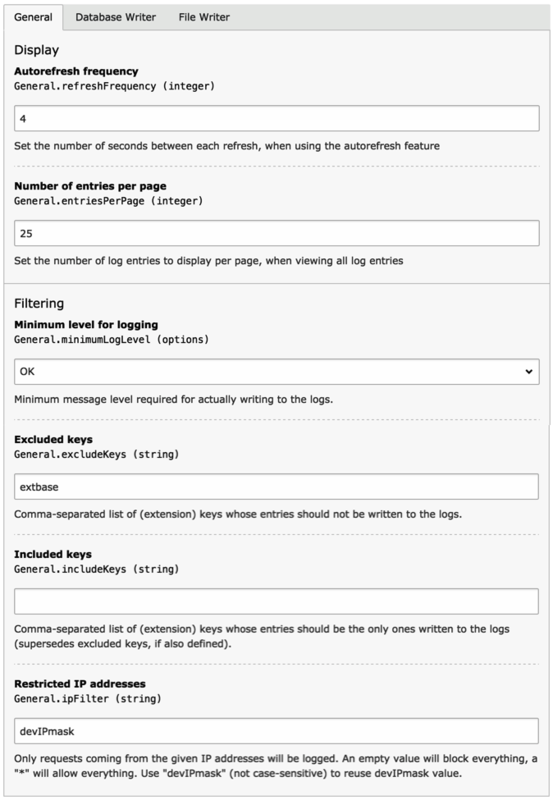 With TYPO3 v8, you need to set $GLOBALS['TYPO3_CONF_VARS']['SYS']['enable_DLOG'] = true; to activate the Developer’s Log. Otherwise no entries will be written at all. The backend module can refresh itself automatically, loading all new entries that were logged since last module load. The frequency is given in seconds. Number of entries displayed at one time in the backend module. Log entries come with a severity that can have the following values: -1 for ok, 0 for an information, 1 for a notice, 2 for a warning and 3 for an error. With this setting you can define from which level you want to start logging entries. All entries with a severity below that setting will be ignored. Every log entry (normally) comes with a key. This is generally an extension key or a class name. This parameter allows you to define a (comma-separated) list of keys that you don’t want to log. This will help keep your log table smaller. Leave this property empty to log entries whatever their key. While “Excluded keys” is a black list, “Included keys” is a white list. As soon as you define a (comma-separated) list of keys to include, only those entries that match these keys will be logged. All others are ignored. The “Included keys” property supersedes “Excluded keys”. With this setting you can restrict logging to activate only when some IP addresses are matched. This property takes a comma-separated list of IP addresses. It can also take the special value devIPmask in which case it will reuse the value from [SYS][devIPmask]. Set this property to * to log entries whatever the incoming IP address. On the contrary, set it to an empty value to block everything. 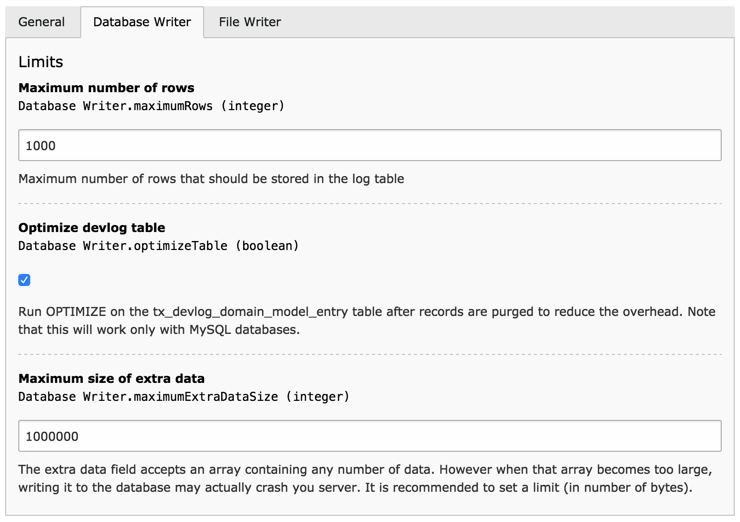 This parameter sets an absolute limit on the number of log entries that are stored in the database. When that limit is reached, about 10% of the oldest entries are deleted to make room for new ones. If you don’t want any limit, set this parameter to zero. The database table may see a lot of operations, both inserts and deletes. After a time some overhead accumulates. By selecting this option, an optimization is run every time entries are deleted, as per the “maximum number of rows” option above. This operation uses the “OPTIMIZE” SQL statement which is proprietary of MySQL and and is not compatible with DBAL. If you use another database than MySQL you should not activate this option. Data of any kind can be passed along to the “devLog” call. The Database Writer serializes it before storage. This so-called “extra data” can become quite large in some situations which could bog down the database server. To prevent this from happening, this setting will limit the size of the extra data (once serialized). The default value is 1 million (characters). Any data above this limit will be stripped and replaced by an informational message. Another way to keep the database table under control is to use the Scheduler’s Table garbage collection task to remove all records beyond a certain age. The path to the file where the log entries should be written. If left empty, the File Writer is disabled.